Today we set the alarm for 7:15am. We had to get organised and be organised and downstairs to get the bus to the walking tour which started at 9am outside the parliment house building. The walking tour took us to some of the historic sites of Berlin. Some of these included Checkpoint Charlie, Topographie des Terrors, Memorial to the Murdered Jews of Europe, Brandenburger Tor and Reichstag. 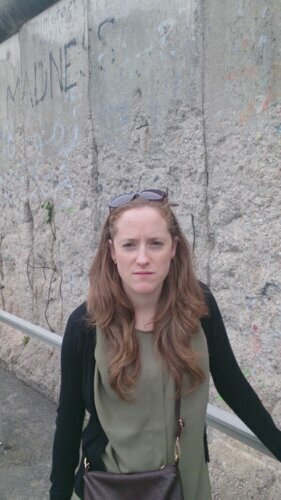 Seeing the Berlin wall was not as impressive as I thought it would be. I expected this massive wall that you could not pass. However what remains is just a few sheets of 3.1 meter concrete. What you can see today that it was actually two walls with a coridor in the middle. This was no mans land. This involved trip wires, barbed wire and mines. If you got in here you either triggered a deadly explosion or shot by one of the 300 guard towers staffed with snipers pertrolling the no mans land. Over 100 people were killed on the Berlin wall before it was pulled down in 1989. After the tour finished and a toilet stop at macas a group of us went back to the Topographie of Terror. This is were a section of the wall remains along with the footings of the buildings that once stood in its place. It is now an free outdoor museum detailing a range of topics about the Nazi rule over Germany and the role Berlin played. After getting what we wanted out of this site Rhian I and Amy broke away and walked from the site to the TV Tower in the heart of the city. This was a fair walk but allowed us to explore the city some more. 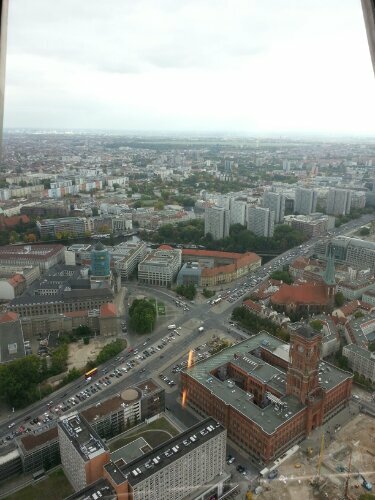 We reached the TV tower and could not buy tickets eletronicly. However we were still able to buy cheaper tickets by lining up. The only problem was we needed to wait a couple of hours to get up the tower. This worked out fine for us as we could buy the tickets then go looking for the I Love Berlin T-shirts we needed and get some lunch. We bought the tickets shortly after 1pm and were told to come back around 3:15pm. This is what we did. We found a store that had the T shirts we were looking for and they were only $10 euros. 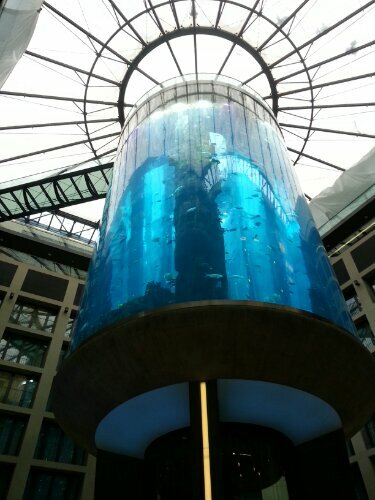 We walked around a little more and ended up going to the toilets at a fancy hotel that had a huge massive elevated fish tank in the middle of it. After this we sat at a restraunt and had lunch. By this time it was pretty much time to go back to the TV Tower for our viewing. We headed back to the tower only to find we needed to wait an extra twenty or so minutes to go up and admire the view. 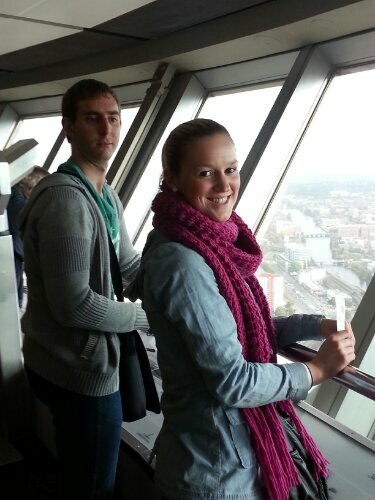 After some more time killing we were allowed through security and go up the tower in the elevator. We took a stack of photos up the tower which are mostly on the camera. I think a couple are attached below from the phones. After coming down the elevator again we made our way to the train station to catch the train back to our hotel. Tickets cost us $2.60 euro. This seemed expensive compared to what we have paid other countries. However this was the price. Once back at the hotel Rhian went to sleep and I caught up on writing these blogs. Seven pm quickly came around and it was time to get ready for the pub crawl. Because of my blog writing and waking Rhian up we didn’t have time for dinner before the pub crawl. Our tour bus dropped us into the city for the start of the pub crawl where we were given a free beer upon arrival in the street. Drinking in the streets of Berlin is legal. Apparently. We visited three pubs in total which I only had one beer at each. I didn’t like the beers they had on offer. Not compared to the one at the beer hall the night before. After the three pubs we caught the train back to the hotel area where we went to one club nearby the hotel. Rhian and I only stayed for one drink as we had had enough and were due to have an early start the next day on the bus. 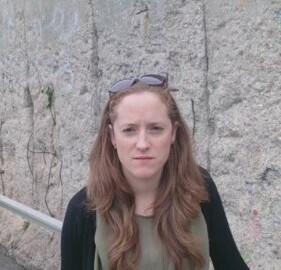 Rhian in front of the remains of the Berlin wall.